We have made regular trips to Galveston in recent times mostly due to the Texas Tequila & Margarita Festival and Moody Gardens. It’s hard to beat patio seating near the beach and a cold margarita. There are many options in the area ranging from grabbing a frozen margarita on the seawall or heading down to the strand to visit one of the many bars and restaurants. While we have not sampled all that the island has to offer, several locations stand out for having delicious drinks. 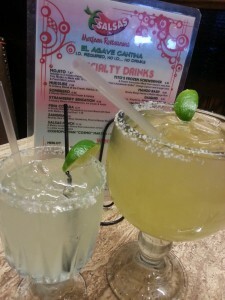 Out of all that we have tasted so far, these stand out as the best margaritas in Galveston. Lucky Lounge – 8305 Stewart Rd, Galveston, TX 77554 – Won 1st place for best margarita at the 2015 Texas Tequila & Margarita Festival. 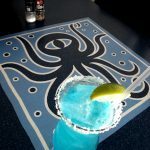 Olympia Grill Pier 21 – 100 21st St, Galveston, TX 77550 – Two locations in the area, one on the seawall and Pier 21 near the strand and both serve their signature Greekarita. Salsa’s Mexican Restaurant – 4604 Seawall Blvd, Galveston, TX 77551 – The Dead Gold margarita is top notch. 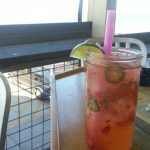 The Spot (Squeeze Tequila & Margaritas) – 3204 Seawall Blvd, Galveston, TX 77550 – Excellent view of beach and margaritas to match. 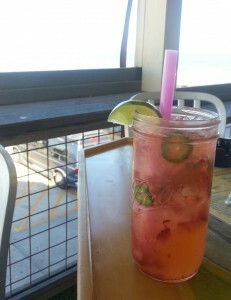 The strawberry jalapeno margarita is one of our favorites on the island. What do you think of this list? If you have a favorite margarita in Galveston, let us know in the comments. We try to visit new locations during every visit so we would enjoy knowing popular places we missed or hidden gems. 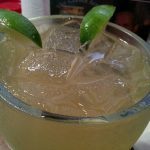 We have visited and reviewed many margaritas throughout Texas, find out where our travels have taken us throughout the Lone Star State, check out our alphabetical listing of reviews or our interactive map. If you want to find out where our future travels take us, join our mailing list you will also ….